As Diwali comes close another shopping spree looks on the horizon. The sales are coming all around with brick and mortar stores offering deals side by side with the online stores. Be it Flipkart, Amazon or Jumbo Electronics, they all have created their own buffet for buyers to choose from. Diwali, in India is probably the biggest shopping festival as well. While people might buy something on other festivals, on Diwali, it is a given that many homes see a sort of renovation in terms of items. Be it the new TV or a new Sofa, Diwali seems to be the perfect occasion for this. As the festival is generally within days of Eid, the timing is befitting for the whole country. Even right now (almost a month before) the offers have started pouring in. Be it the Flipkart offer that is going to last for 5 days or the month long Diwali sale that Jumbo Electronics has started in its Brick and Mortar stores, the time to pick your favorite items is upon us. There are a few things I would want to discuss here that should be kept in mind while shopping. 3 The Discounts Mentioned Are On MRP, So Don’t Get Impressed Easily. For example, Nokia Lumia 920 can be bought for less than Rs. 19000 right now from Flipkart. It is an excellent phone in all respects and I would recommend you to go for it, If you want a windows phone. But, if you want to use an Android phone, do not jump to this phone just because it is going cheap. Similarly, do not go for a lower quality phone just because its discounts are higher than a better phone. Take the decision of what you want considering there are no discounts and then find the best deal for WHAT YOU WANT. Generally, most people prefer a straight Rs. 1000 off than getting anything like a Bluetooth device as a bundled offer on the purchase. This doesn’t mean the offer is poor. If you will get a Bluetooth device later anyway, the offer may be useful for you. Besides, you get other goodies (Its Diwali so you will get more than one thing) that completely offset the Rs. 1000. Keep a watch for these things. The Discounts Mentioned Are On MRP, So Don’t Get Impressed Easily. 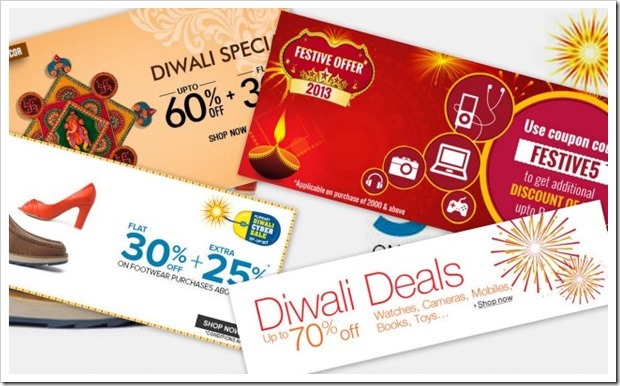 Most discounts that you see on online stores are on MRP. Electronic gadgets never sell on MRP. Therefore, do not get impressed by big numbers like 30% or 40% off. It is highly probable that the item was already at 25% off without the discounts. In fact, you might get it at a lower price in any shop near you. Thus, do a thorough research before buying. The way ecommerce sites present the discounts and offers, you might think that you have the best deal on a particular mobile, gadget or appliance. However, remember that India is still 95% offline and more often than not, your street side shop will offer you a better deal than the best price you get online! While people are mostly careful in buying things in normal period, the Diwali sale brings the shopaholic out in everybody. So, please be careful of where you buy to get the best possible discounts for what you want. Is Indian E-Commerce Digging Itself into a Hole?